Let’s take a cruise down the Potomac from its source in the mountains of West Virginia to its mouth at the Chesapeake Bay. The journey down this mighty waterway details six EPA Superfund sites created by the Pentagon’s reckless disregard for the fragile ecosystem of the Potomac River watershed. The U.S. Navy’s Allegany Ballistics Laboratory in Rocket Center, West Virginia, 130 miles north of Washington, is a critical source of contamination in the Potomac River. The on-site disposal of explosive metals and solvent wastes contaminates soil and groundwater with hazardous chemicals. The groundwater and soil along the river are laced with explosives, dioxins, volatile organic compounds, acids, laboratory and industrial wastes, bottom sludge from solvent recovery, metal plating pretreatment sludge, paints, and thinners. The site also has a beryllium landfill. An active burning area is still used for waste disposal, sprinkling chemical dust over the river. It’s not good. Traveling the river 90 miles further south brings us to Fort Detrick in Frederick, Maryland, the Army’s “proving ground” for the nation’s biological warfare program. Anthrax, Phosgene, and radioactive carbon, sulfur, and phosphorous are buried here. The groundwater is laced with deadly trichloroethylene, a human carcinogen, and tetrachloroethene, suspected of causing tumors in laboratory animals. The Army tested ghastly and heinous agents here, like Bacillus globigii, Serratia marcescens, and Escherichia coli. Although the DOD says it ceased biological weapons testing for offensive purposes in 1971, the claim is like the military’s placement of “defensive” missile systems near an enemy’s border. Fort Detrick also has a history of dumping high levels of phosphorus into its drain system that ultimately washes into the lower Monocacy River, a tributary of the Potomac. In fact, the Maryland Department of Environment has cited the Army for exceeding allowable permit levels. Too much phosphorus in the water causes algae to grow faster than the Potomac ecosystem can handle. It is deadly. The Army is a leading polluter of the Potomac River watershed. Just 40 miles down the river from Fort Detrick lies Washington’s Spring Valley neighborhood and the campus of American University. This area was used by the Army during World War I to test Lewisite, a lethal gas made of arsenic. Soldiers tied animals to stakes and set off chemical bombs to see how quickly the animals died. The area was densely covered with deadly biological agents and soldiers buried the remaining stockpiles of munitions after testing. Perchlorate and Arsenic are present in groundwater today. Toxic pits of buried chemicals have contaminated groundwater close to the Dalecarlia Reservoir, just off the Potomac. Five miles further south, the Washington Navy Yard is located on the Anacostia River, close to its confluence with the Potomac. It is one of the most contaminated patches of real estate in the country. The Navy Yard was a former foundry for the manufacture of cannons, shells, and shot. The ground adjacent to the river is contaminated with tetrachloride, cyanide, perchloroethylene, carbon tetrachloride, dichloroethene, vinyl chloride, lead, and heavy metals, acids, cleaners, caustics, iridite and alkaline, lead, chromium, cadmium, antimony, polychlorinated biphenyls (PCBs) and dioxins. Along the Maryland shoreline, 20 miles from the Navy Yard, we come to the Indian Head Naval Surface Warfare Center in Charles County, with its 100-year history of dumping and burning hazardous waste products. The site routinely discharged industrial waste into septic systems, open ditches and storm sewers that emptied directly into surrounding water bodies which empty into the Potomac. Surface water at the facility is contaminated with high levels of mercury. Groundwater samples collected at Indian Head contained perchlorate at concentrations between 1,600 and 436,000 ug/L. To put these data into context, the Maryland Department of the Environment established a drinking water advisory level of 1 ug/L. Perchlorate has been linked to its negative effect on the thyroid gland. At Dahlgren, discarded mercury is mixed with sediments in Gambo Creek, which empties directly into the Potomac. The burial of munitions contaminated with heavy metals and polyaromatic hydrocarbons (PAHs) have poisoned the earth along the mighty Potomac. PCBs, Trichloroethane, and various pesticides mix with lead contamination from firing ranges and buried depleted uranium used to make a type of nuclear weapon known as a bunker buster. In 1608 John Smith was the first European to explore the waters of the Potomac from the Chesapeake Bay to Washington. Describing the river and the Chesapeake, Smith wrote, “Heaven and Earth never agreed better to frame a place for man’s habitation.” It is still lovely, but 400 years later, the waters and soils are poisoned. The EPA Superfund sites described above will soon receive much less attention than they should because President Trump’s 2018 budget plan calls for cutting the Superfund cleanup program by about a quarter. The EPA has identified these poisons in the waters of the Potomac river basin, all of them the result of military activities: Acetone, Alkaline, Arsenic, Anthrax, Antimony, Bacillus Globigii, Beryllium, Bis(2-ethylhexyl) Phthalate, Cadmium, Carbon Tetrachloride, Chromium, Cyanide, Cyclonite, Depleted Uranium, Dichloroethylene, Dichloromethane, Dinitrotoluene, Dioxins, Escherichia Coli, Iridite, Lead, Mercury, Nickel, Nitroglycerin, Perchlorate, Perchloroethylene, Phosgene, Phosphorous, Polychlorinated Biphenyls (PCBs), Polyaromatic Hydrocarbons (PAHs) , Radioactive Carbon, Radioactive sulfur, Serratia Marcescens, Tetrachloride, Tetrachloroethane, Tetrachloroethylene, Toluene, Trans-Dichloroethylene, Trichloroethene, Trichlororethylene, Trinitrobenzene, Trinitrotoluene, Vinyl Chloride, Xlene, and Zinc. The Potomac is far from unique. Sixty-nine percent of U.S. Superfund environmental disaster sites are the result of war preparations. Preparations for war cost over 10 times the money that actual wars do, and cause at least 10 times the deaths. Routine U.S. military war preparations cause deaths by diverting resources from human needs and directly through massive environmental destruction spread all over the world including in the United States, and including in the Potomac. So-called foreign intervention in civil wars around the world is, according to comprehensive studies, 100 times more likely — not where there is suffering, not where there is cruelty, not where there is a threat to the world, but where the country at war has large reserves of oil or the intervener has a high demand for oil. The U.S. military is the top consumer of petroleum around, burning more of it than most entire countries, and burning much of it in routine preparations for more wars. There are military planes that can cause more damage with jet fuel in 10 minutes than you can with gasoline driving your car for a year. All such calculations omit the environmental destruction done by private weapons makers and by their weapons. The U.S. is the leading exporter of war weapons to the rest of the world. All such calculations also omit much of the damage and all of the details of the human suffering. The U.S. military burns toxic waste in the open, near its own troops in places like Iraq, near the homes of the people who live in the countries it has invaded, and within the United States in many — often poor and minority — communities such as Colfax, Louisiana, and at Dahlgren on the Potomac. Much of the damage is essentially permanent, such as the poison of depleted uranium, used in places like Syria and Iraq. But this is true in locations all around the United States as well. Near St. Louis, Missouri, an underground fire is moving ever closer to an underground pile of radioactive waste. And then there is the Potomac River. 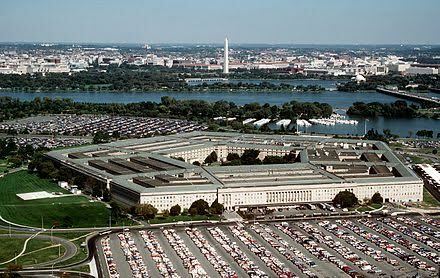 It flows south between the Lincoln and Jefferson Memorials in Washington, D.C. on the east, and Arlington, Virginia, on the west, where the Pentagon Lagoon brings the water up to the headquarters of world militarism. Not only does the home of war making sit near rising waters — rising first and foremost because of the effects of war making, but those particular waters — the waters of the Potomac and of the Chesapeake Bay into which it flows, and the tides of which raise and lower the waters of the Pentagon Lagoon each day — are heavily polluted by war preparations. This is why we are planning and invite you to join in a kayactivist flotilla to the Pentagon on September 16th. We need to bring the demand of No More Oil for Wars to the doorstep of our leading destroyer of the environment.